Ghulāt (Arabic: غلاة‎, lit. 'exaggerators'‎, singular ghālī) is a term used in the theology of Shia Islam to describe some minority Muslim groups who either ascribe divine characteristics to figures of Islamic history (usually a member of the Ahl al-Bayt) or hold beliefs deemed deviant by mainstream Shi'i theology. In later periods, this term was used to describe any Shi'i group not accepted by the Zaydis, orthodox Twelvers, and sometimes the Isma'ilis. The usage derives from the idea that the importance or the veneration of such a religious figure has been "exaggerated". 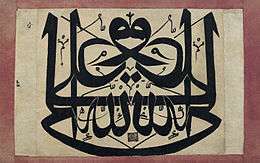 Traditionally, the first of the ghulāt was Abdullah ibn Saba', who may have denied that Ali had died and predicting his return (rajʿa), which was considered one form of ghuluww. Also, the notion of the Occultation or absence of an Imam who is due to return and establish justice as mahdi seem to have appeared first among the ghulāt. Other positions which seem to have been considered ghuluww by early writers were the (public) condemnation (sabb) of Abu Bakr and Umar as usurpers of Ali's right to be a successor of Muhammad, and the notion that the true Imams were infallible (maʿṣūm). In later periods, mainstream Shia groups, especially the Imamiyya, have identified three acts that have been judged as "extremism" (ghuluww). These acts of heresy are: the claim that God sometimes takes abode in the bodies of the Imams (ḥulūl), the belief in metempsychosis (tanāsukh), and considering Islamic law to be not obligatory (ibāḥa), similar to antinomianism. 1 2 3 Hodgson, M. G. S. (1965). "GHULĀT". Encyclopaedia of Islam. 2 (2nd ed.). Brill Academic Publishers. pp. 1093–1095. ↑ Heinz Halm (21 July 2004). Shi'ism. Edinburgh University Press. p. 154. ISBN 978-0-7486-1888-0. Tucker, William Frederick (2008). Mahdis and millenarians: Shī'ite extremists in early Muslim Iraq. Cambridge University Press. ISBN 978-0-521-88384-9. Halm, Heinz (1982). Die islamische Gnosis: die extreme Schia und die ʻAlawiten. Artemis Verlag. ISBN 978-3-7608-4530-2.